How long will a straw bale last? Where is the best place to position a bale garden? Please share your bale gardening experiences with us. 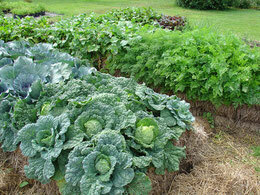 Benefits of gardening in garden beds made from hay and straw bales. People who find heavy lifting, digging or weeding difficult will benefit because once the bales are in place, less lifting, digging or weeding is necessary to maintain your bale garden. Gardeners who find difficulty bending will find it easier to access the higher planting surface of a straw bale raised bed and have a comfortable place to sit and work from. A raised bed formed from bales can eliminate the need for bending over. Gardeners with poor soil or limited space will like bale gardening for its fertility, It is cheap and fits even the smallest patio. Also the very good compost that's left as the straw decomposes can be spread over poor soil to improve it. If you keep placing the new bales on top of the old ones you will eventually end up with some very good soil full of earthworms. If you keep this up, you could be on your way to the "no digging method of gardening" described on my website. People who like trying something new in the garden will like using bales, if you are looking for a fun, new and efficient method of gardening, try bales. Small gardens. Hay or straw bails are perfect for small paved garden, where planting and growing space is limited. To condition your hay or straw bales (get them ready) for planting, first move them into place, bales are a lot heavier when soaked and will be too heavy to lift, then water your straw or hay bales every day for about two weeks. Conditioning (getting bales ready for planting) really is that easy. If you set them out in winter you won't need to water manually and the bales will be ready for spring planting. You can speed the conditioning process up by watering for three to four days and then adding a layer of soil or compost to the top of the bales. You can plant and grow directly into the hay or straw bale spacing the plants as you would in a garden. Planting. Make a slit in the top of the hay with a spade and simply plant the plants you have selected. Small seedlings might benefit from a sprinkling of fine soil to give bit of support. Sowing seeds. If you are sowing seeds into the hay or straw bale, its a good idea to sprinkle some compost or topsoil into the surface or slits you have made with the spade, this stops the finer seeds falling to deep into the bale. sowing depth, top up the slit with soil, sow the seeds and cover with fine soil. Sowing potatoes. Potatoes (all root crops carrots, parsnips and swede, etc.) do well in bales. Make a slit with a spade and plant the potato in the center of the bale about an inch deeper than you would in soil. It is important to plant potatoes in the middle to stop the new potatoes breaking through the sides. Tall plants like some varieties of tomatoes will need supporting with stakes, push long sticks all the way through the straw bale making them secure. The very good compost that's left as the straw decomposes can be spread over poor soil to improve it. If you keep placing the new bales on top of the old ones you will eventually end up with some very good soil full of earthworms. If you keep this up, you could be on your way to the "no digging method of gardening" described on my website. Almost anything you can grow in a garden will grow well in hay and straw bales. No need for a list of suitable plants everything will grow in bales. Cabbages, dwarf beans and many more vegetables and fruits from strawberries to tomatoes can be planted as seedlings or sown from seed. The exceptions (unless you support them with stakes, trellis or netting) are tall plants like runner-beans. Deep growing root crops like potatoes will do well in a hay bale garden, but bear in mind you will have to break up the hay bale to harvest the potato crop. Might be better to grow them in the final year of the bale garden, when you will be breaking it up anyway and replacing it with new bales. Taller plants will need support by pushing long stakes all the way through the straw bale to make them secure. The pleasure you will get from doing something a bit different in your garden, harvesting fresh fruit & veg combined with the added benefit of not having to dig, make hay bale gardening really worthwhile. a square with four hay bales filling the square with topsoil and plant in both the soil and the bales. If bending is difficult, plant the hay bales to leave a space between the plants, to sit, reach across the middle and work from. Otherwise space the plants as you would in a garden. Raised beds made from hay or straw bales can be constructed to double height (one on top of the other) if you need to avoid having to bend over and can work standing up. To be extra safe, if going two high, lean the bales against a south facing wall or similar sound construction. If this is not possible push stakes through both bales to hold them together. 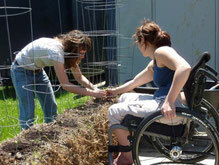 The plants in straw and hay bales are reachable from a wheelchair and a bale garden is relatively weed-free, quite handy if bending is difficult. Bales of straw or bales of hay can be sited almost anywhere in your garden, providing it gets a fair share of sunshine (most plants especially fruit wont thrive in shade) and water, even on rocky soil, hard heavy clay soil, or concrete and patio slabs. Hay bale or straw bail fruit and vegetable beds are perfect for small paved gardens, where planting and growing space is limited. Can I position bales in a soggy part of my garden ? If you have a boggy or poorly drained area in your garden you can build the hay bale over the area, you will need to water less frequently, or maybe not at all if its really waterlogged, as the hay or straw bales will soak the water up into the bale. How growing in bales works. All this works because hay and straw bales contains microorganisms which eat away at bacteria inside the hay and straw producing compost inside the bale creating a perfect environment for growing plants. Keep the moisture inside the hay bale maintained and nature will do the rest. Will heavy rain effect my outdoor bale garden? Hay bales drain very well, so you won't have to worry about them getting wet in heavy rain. The drainage properties of hay bales mean root rot and many other damp related plant diseases are not a problem. Can I position bales in a soggy part of my garden? If you have a boggy or poorly drained area in your garden you can position the hay bale over the area, and water it less, or maybe not at all if its really waterlogged, as the hay or straw bales will soak the water up into the bale. How long will a hay bale or straw bale last? Hay bales will last for up to two years, straw bales will last up to three years, you can then add the broken down remains of rotting hay or straw to your compost heap or spread it over your garden. Ask for tightly bound bales as they stay in shape longer. Where's the best place to position a hay or straw bale garden? Bales of straw or bales of hay can be sited almost anywhere in your garden, providing it gets a fair share of sunshine and water, even on rocky soil, hard heavy clay soil, or concrete and patio slabs. Hay bale or straw bail fruit and vegetable beds are perfect for small paved garden, where planting and growing space is limited. 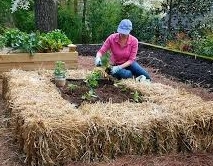 Interesting, simple and cheap ways to make raised garden beds, using hay and straw bales. Plants can be grown directly in the hay bale or you can form a square with four hay bales filled with topsoil, and plant in the middle. If bending is difficult, plant the hay bale to leave a space between the plants, to sit and work from. Otherwise, space the plants as you would in a garden. Raised beds made from hay or straw bales can be constructed to any height to avoid bending over if you have a bad back or a disability. Plants that can be grown in bales. Almost anything you can grow in an English country garden will grow well in your bale garden, from cabbages, dwarf beans and many more vegetables and fruits from strawberries to tomatoes. Taller plants will need support by pushing long stakes all the way through the straw bale to make them secure. Deep growing root crops like potatoes do well in a hay bale garden, do bear in mind you will have to break up the hay bale to harvest the potato crop. Might be better to grow them in the final year of the bale garden, when you will be breaking it up anyway and replacing it with new bales. What do you get out of growing in bales? Apart from organic produce the pleasure you will get from doing something a bit different in your garden combined with the benefits of not having to bend over to plant and harvest your straw bale garden and the added benefit of not having to dig, make hay bale gardening really worthwhile. What is the best Hay bales or straw bales? Straw consists of only the stems of the plant, and will have few seeds, hay is cheaper to buy, but will contain seeds, I have never found this a great problem. Choose tight bales securely bound with twine or wire, if possible purchase the bales the autumn before you plant. Maintaining planted bales. Maintenance of garden beds made from straw and hay is easy, keep the bale garden watered during hot dry weather, a little bit of weeding and nature will do the rest. Enjoy your organic harvest and please share your straw bale gardening experiences and hay bale gardening tips with the rest of us.